​Admissions Policy available for download here. ​Thursday September 27th 2018, 4.30pm to 6.45pm. ​Principal's address will be at 6.30pm. 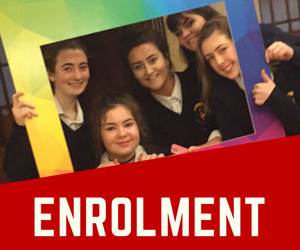 Enrolment application forms will be distributed to our feeder schools prior to our Open Evening. ​Enrolment applications must be posted or handed in to the school office. The school does not accept applications by email.